Is It time? ————Yes, it is! 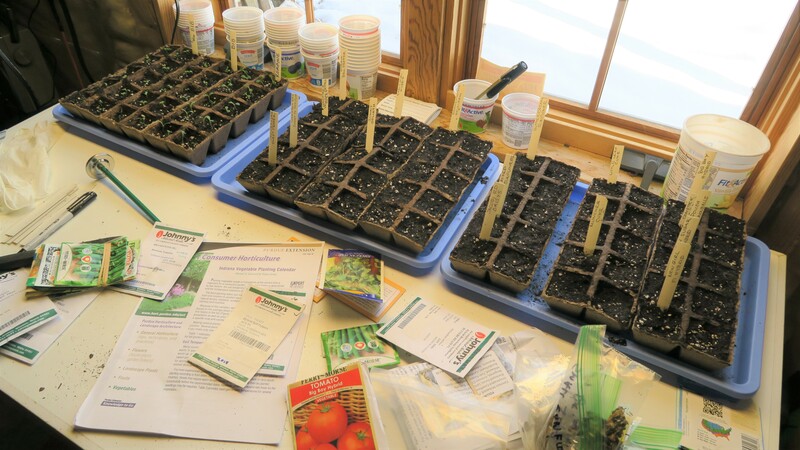 — and if you start vegetables and flower seed indoors in late March and early April and give the seedlings some TLC you will have a jump start with home grown transplants to move to your garden after the last spring frost. Cold weather crop seeds like Broccoli and Greens can even be started indoors as early as February. By starting your seeds indoors and taking tender care of the plants you will have strong healthy transplants which will flower and bear sooner allowing an earlier harvest than plants started directly outdoors. Growing from seed allows you to buy seeds for many more plant varieties than you will find for sale in the plant supply store and gives you the opportunity to experiment with unusual flavors, shapes, and colors of plants. Have fun by trying an heirloom tomato variety like Brandywine or a Crested or Plume Celosia flower which may be difficult to find as a transplant at your plant store. Another advantage worth mentioning is by staggering the start date of seeds you can spread your harvest over a longer period and avoid having all the fruits mature at the same time. Gather your seeds and supplies and if you love to watch plants grow, jump in and start your seeds now. To help you get started, here are links to two publications from the Purdue Horticultural experts which you can download and print…… Good Luck and enjoy. Great and timely information, Don. Thanks so much. Thanks Don ! Looking forward to watching some seeds grow this year.